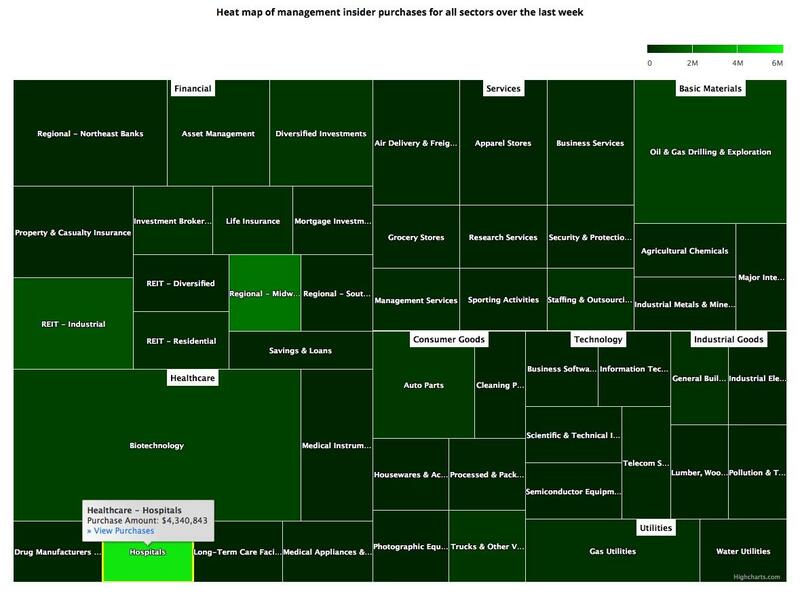 Insider buying declined again last week. Notable Insider Buys: Revlon, Inc., Equitrans Midstream Corporation, Select Medical Holdings Corporation, RCM Technologies, Inc., Cadence Bancorporation. Notable Insider Sales: Walmart Inc., Ulta Beauty, Inc., Workday, Inc., Best Buy Co., Inc., O'Reilly Automotive, Inc.
Insider buying declined again last week with insiders purchasing $53.36 million of stock compared to $80.53 million in the week prior. Selling also decreased with insiders selling $1.58 billion of stock last week compared to $2.37 billion in the week prior. Revlon's stock dropped sharply earlier this month after the company reported disappointing fourth quarter results where revenue declined 5.7%. What spooked investors even more was the company's decision to delay the filing of its annual report after disclosing that "it identified a material weakness in its internal control over financial reporting as of year-end 2018". The stock started the month at $26.52 and dropped to $18.02 by March 19th. 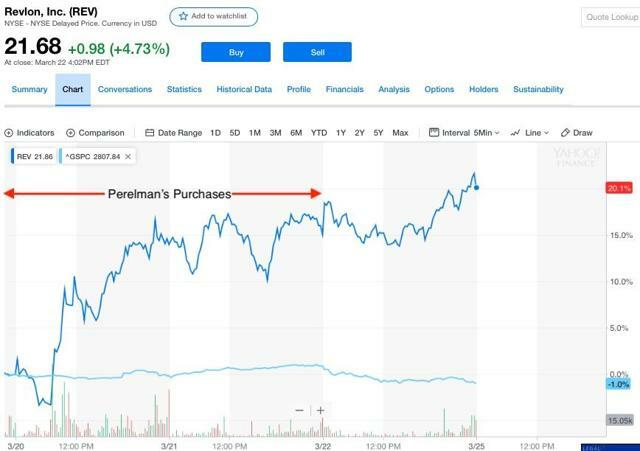 Mr. Perelman's purchases took place on March 20th and 21st and the stock rebounded nearly 20% through the end of last week even in a weak market as you can see from the chart below. Perelman's Revlon Purchases. Chart Source: Yahoo Finance. Equitrans Midstream was spun out of EQT Corporation (EQT) "to separate its separately managed gathering, transmission and storage, and water services operations (Midstream Business) from its natural gas, oil and natural gas liquids development, production and sales and commercial operations (Upstream Business)." The spinoff was affected late last year and EQT maintained a nearly 20% interest in ETRN after issuing 0.8 shares of ETRN for each share of EQT held. If you subscribe to Joel Greenblatt's philosophy of paying attention to spinoffs and following the actions of the insiders of the new spinoff, then this purchase appears to be bullish. Mr. Karam started his career in investment banking and later served as the CEO of three companies in the oil and natural gas industry that were eventually acquired. Chairman of the Board David E. O'Reilly sold 34,000 shares for $375.48, generating $12.77 million from the sale. 25,500 of these shares were purchased indirectly through a trust. 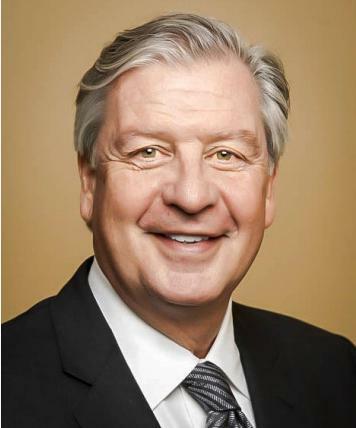 Director Lawrence P. O'Reilly sold 5,600 shares for $375.48, generating $2.1 million from the sale. Disclosure: I am/we are long WDAY. I wrote this article myself, and it expresses my own opinions. I am not receiving compensation for it. I have no business relationship with any company whose stock is mentioned in this article.